London’s latest urban regeneration project the Culture Mile aims to rebrand the Square Mile into a go-to place for arts and culture. Launched in July 2017, by the City of London, the vision is to design a zone which stretches just under a mile from Farringdon to Moorgate buzzing with events, pop-ups, art installations and street shows. Yet, how do people who visit, live or work there make sense of these changes? How do the physical redevelopments and rebranding efforts involved in urban regeneration change the feel of the place and peoples’ attachments to it? As the findings of our project illustrate thinking about how individuals experience the city, from a temporal and sensory perspective, offers a new lens to study the lived effects of the city’s financial, political and social processes. The Corporation of London’s ambition to build an area where ‘creativity is the most valuable currency’, brings together a range of cultural partners including The Museum of London, The Barbican, The Guildhall School of Music and Drama and the London Symphony Orchestra. It also coincides with the opening of Farringdon’s new Crossrail station which will link the area to the West End, bringing in 27 million passengers every year. By 2023, The Museum of London will relocate from London Wall, where it has reached capacity, to West Smithfield aiming to increase visitors from 900,000 to 2 million. The derelict west side of the Victorian market building neighbouring the fully working wholesale meat market will be renovated to house the extensive museum collection. The City of London Corporation is currently undertaking a strategic review of all of it’s wholesale markets in order to consolidate them on a single site in East London, which could mean the closure of Smithfield’s meat market and further changes to the site. Our research reveals that the Smithfield Market area has a unique identity which contains traditional working histories and practices alongside signs of rapid gentrification. Its combination of historic buildings from various periods makes it one of London’s most architecturally and historically diverse and eclectic spaces. The area is dominated by the 1875 Victorian market building which was built on the site of the 9th century open air cattle market. The market is surrounded by medieval street patterns, 12th and 14th century monasteries, a 12th century hospital, Victorian commercial buildings plus 1930s residential art-deco buildings, 1960s brutalist buildings such as the Barbican and modern glass office buildings. It is further characterised by the diverse mixture of social groups which gives it a distinctive feel. Our study, in collaboration with the Museum of London, aimed to examine the role of sensory experiences and temporal rhythms in shaping the past, present and future identity of place. It explored how the senses feed into someone’s experience of the area and how the rhythms of place vary over a 24 hour period. We explored how smells, sounds, textures, colours, lighting and temperature changes alter the feel of place and our relationship to it. We explored how we register changes in the urban environment through the sounds we hear, by the textures we feel beneath our feet, the smells that emanate from nearby buildings and temperature changes we experience as we pass through streets and alleyways. This sensory landscape informs how we relate to places: whether we like them or not, whether we feel attached or indifferent. The history of Smithfield Market and the surrounding streets and buildings is integral to the present day sensory character of the area. But not all histories are equal so we investigated which stories are retold and how they feed into the future rebranding of the area. We found that the newly developing sensory landscape disrupts the existing feel of place creating new environments and physical sensations such as the screeching metal of cranes, the sensations of smooth concrete under foot or the projection of future images on bill-board hoardings. We visualised common trends and patterns from this experiential data through a range of evocative maps. Key words used to describe the area based on 150 vox pox interviews. The meat market clearly influences the temporal rhythms of the area from when it opens for trade at 2am with large lorries starting to unload the carcasses and boxes of poultry. Cafes serve market workers 24hours a day and therefore offer respite to black cab drivers, clubbers, couriers and homeless people throughout the night. Traditionally the local pubs have had special licensing hours to accommodate the overnight trade, which has made the area well-known for an early morning pint. Building on the areas foody identity high end bars and restaurants have opened up over the last 25 years which has made the surroundings a popular destination for evening meals and drinking. Clerkenwell and the City of London neighbour Smithfield’s, and office workers pass through at rush hour or flock for after-work drinks. Additionally long standing institutions such as St Barts Hospital, The Order of St Johns and Charterhouse squares and gardens offer a quiet retreat. Smithfield’s diverse pockets of activity from different groups produce distinct and overlapping temporal cycles, activity rhythms and tempos of place. Urban change is a profoundly felt experience, our study shows, because of how sensory atmospheres change and contrast with expectations, and upset people’s habits and routines which can create new clashes. 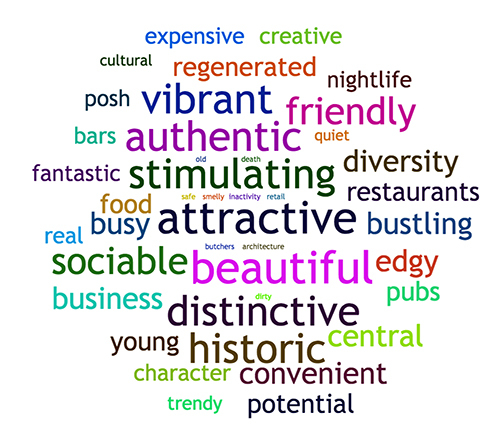 Most of our respondents shared their concerns about the future of the area, emphasizing how they hope the move of the Museum of London will retain the area’s distinctive ‘buzzing’ atmosphere with its ‘muddle’ of architectural styles, social groups and experiences. Urban transformations have an uneven effect and creates feelings of exclusion for certain groups, or different intensities of change across a locality. A sense of anxiety about how these transformations will be managed in future prevails and tensions are rife about the forthcoming regeneration of the market and its changing uses. But, what is ultimately at stake is the identity of the area and people’s personal attachments which are formed by the unique rhythms and sensescapes of Smithfield. Visualising the way urban interventions transform urban experiences through digital means offers new ways for policy makers, planners, architects or urban researchers to think through the lived effect these changes have on people’s sense of place.